LIC Bima Diamond Plan (Table No. 841) is a non-linked, with-profit, limited premium payment money back life insurance policy. The Unique Identification Number of the LIC’s Beema Diamond Plan is 512N307V01. This UIN no. should be quoted in all relevant documents provided to the policyholders. The LIC Bhima Diamond Policy is a new Money Back plan introduced on 1st September 2016 at Mumbai by the Finance Minister Shri Arun Jaitley. On the occasion of Diamond Jubilee celebration, Life Insurance Corporation of India has launched this LIC New Plan 841. Since this LIC New Bima Diamond Plan is a close ended plan, it will be available for sale from 1st September 2016 to 31st August 2017. Most of the people want to invest for few years and get the benefits later. Keeping this in mind, LIC India has designed this New Bima Diamond plan. The payment term of this LIC New Plan 841 is only 60% of the policy term. So, those who are looking for a short term investment that issues guaranteed returns in periodic installments can take this Bima Diamond policy. 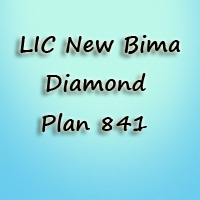 The unique feature of this LIC Bima Diamond Plan 841 is extended risk cover after policy term. That means the corporation provides financial support for the family of policyholder not only during the policy term but also behind the policy term in the extended cover period. Also, the life assured can avail a Death Benefit of ‘Sum Assured equal to ten times’ of the Annualised Premium, which is payable as on date of death. The Key features, Eligibility Conditions, Benefits, Rebates, etc. of LIC’s Bima Diamond Money Back Plan are mentioned in detail below. Life Insurance Corporation of India creates policies based on some target segments like Jeevan Tarun for children, Jeevan Akshay for pension seekers and New Children Money back plan for financial needs of children. But, for the first time in LIC history, they have introduced a new money back plan that can cater all section of customers. The LIC’s Bhima Diamond Policy is thrice as nice with triple advantage. Below are the key features of LIC Bima Diamond Plan. Contributes a fixed percentage of sum assured after every 4 years with policy terms of 16, 20 or 24 years. The premiums can regularly be paid at monthly, quarterly, yearly, or half-yearly intervals or through salary deductions during the premium paying term of the policy. The LIC Bima Diamond Policy provides money back at an interval of every 4th year and maturity at the end of the policy term. This New Plan from LIC offers insurance cover of full sum assured during the policy term and half the amount of sum assured beyond the policy tenure during the extended cover period. Loan facility is available after the payment of premium for at least full three years. Maturity amount is tax-free under 10 (10D). Premiums paid are exempted from income tax under 80C. On a policy of at least 5 full years on which subsequent premium is not duly paid, the auto cover period of two years is available. 1. Minimum Entry Age for Insured 14 years (Completed). 50 years (Nearest Birthday) for policy term 16 years. 45 years (Nearest Birthday) for policy term 20 years. 41 years (Nearest Birthday) for policy term 24 years. 3. Policy Term (Premium Payment Term) 16(10), 20(12), 24(15). 4. Premium Payment Mode Yearly, Half-Yearly, Quarterly, and Monthly. 66 years (NBD) for policy term 16 years. 65 years (NBD) for policy term 20 and 24 years. 7. Premium Payment Mode Rebate 2% on yearly; 1% on Half Yearly; Nil on Quarterly & Monthly. In case, if the death of the insured occurs during first 5 years, Sum Assured on death shall be payable to the nominee. Whereas if the death occurs after completion of 5 policy years but before the date of maturity, the sum assured on death and loyalty addition, if any, shall be payable. If the policyholder’s demise occurs during the extended cover period, an amount equal to 50% of Basic Sum Assured shall be payable as the death benefit to the assignee. If in case the life assured survives till the end of each of the specified durations during the policy term, with all due premiums have been paid, a fixed percentage of Basic Sum Assured shall be payable. The fixed percentage for various policy terms of this LIC Bima Diamond Plan is as follows. For policy term 16 years, 15% of Basic Sum Assured at the end of each of 4th, 8th and 12th policy year. For policy term 20 years, 15% of Basic Sum Assured at the end of each of 4th, 8th, 12th and 16th policy year. For policy term 24 years, 12% of Basic Sum Assured at the end of each of 4th, 8th, 12th, 16th and 20th policy year. In case, if the policyholder survives till the end of the policy term with all due premiums have been paid, the life assured will get Maturity benefit as Basic Sum Assured plus Loyalty Addition. 55% of Basic Sum Assured for the policy term 16 years. These rebates are available on the premium if the policyholder opts for the higher mode and take the high-risk cover policy. There are two optional riders available for this LIC New Bima Diamond Plan i.e., LIC Accidental Death and Disability Benefit Rider (UIN: 512B209V01) and LIC New Term Assurance Rider (UIN: 512B210V01). The policyholder can avail these riders by paying an additional premium. Also, the benefits of optional rider will be available during the policy term only. If the life assured have chosen LIC’s Accidental Death and Disability Benefit Rider, then an extra amount equal to Accidental Benefit Sum Assured will be payable on death due to the accident, provided that the rider is inforce at the time of the accident. If the insured selects LIC’s New Term Assurance Rider, then Term Assurance Rider Sum Assured will be payable on death to the beneficiary of the policy. The Customer can buy the LIC Bima Diamond Plan from the LIC Agent or nearest LIC Branch Office. The Proposal form required to purchase the policy is available on the official website of Life Insurance Corporation. The Documents needed for buying the LIC’s Bima Diamond Money Back Plan are listed below. If the Policy Holder is met with sudden accident or disability within the Policy Term or Maturity Period of Policy is completed, the Nominee can lodge the Claim. The Claim Forms can be obtained from Official Website of LIC or from the LIC Regional Offices. The documents required during the Claim Process of LIC Bima Diamond Plan are listed below. You can calculate the minimum premium that has to be paid to take the Policy by using the LIC Bima Diamond Plan Premium Calculator. The Amount of Single Premium Paid will depend on the Sum Assured, Policy Term and Age of the Insured. You need to enter Some Basic Information like Name, Mail Id, Mobile Number, Age, Policy Term, and Minimum Sum Assured to calculate the premium value. Following are some of the sample tabular annual premium rates per Rs. 1000/- Basic Sum Assured excluding the service tax. Paid-up Value: If the policyholder does not renew the policy for up to 2 years of non-payment, the corporation will never provide them full basic sum assured and future bonus. Rather, they will get only the paid up value of the policy on maturity. Surrender Value: The insured can surrender the LIC Bima diamond policy anytime. But they should not forget that any policy does not give the surrender value if the premium has not paid for at least 3 full years. The surrender value of this plan is always less than the paid-up value as you get it immediately. Loan: If this LIC New Bima Diamond policy has acquired a surrender value, then they can avail a loan during the policy tenure. If all the due premiums have been paid till date of death or maturity then depending upon the Corporation’s experience, the policy shall participate in profits in the form of Loyalty Addition. The LIC Bhima Diamond Plan gives loyalty additions after the payment of all the premiums or on death after 5 years within the policy term. Grace Period: The Grace period of this LIC Bima Diamond Plan is one calendar month, i.e., 30 days for yearly, half-yearly and quarterly modes. For monthly premium payment mode, the grace period is 15 days. Free Look Period: If the insured is not satisfied with the terms and conditions of the policy, he/ she can return it to the LIC India within the free look period, i.e., 15 days from the date of receipt of the policy bond stating the reasons for objections. If the policyholder commits suicide at any time within 1 year from the date of commencement of risk and the Corporation will not entertain any claim except for 80% of the premiums paid, provided the policy is inforce. If the life assured commits suicide within 1 year (12 months) from the date of revival, an amount which is higher of 80% of the premiums paid till the date of death or the surrender value, will be payable. LIC shall not entertain any other claims. 1. Is there are Rider Options available in this LIC Bima Diamond Money Back Plan? Ans. Yes, LIC Accidental Death and Disability Benefit Rider and LIC New Term Assurance Riders are provided to the Life Assured on payment of additional premium. 2. Should Policyholder receive any money on Maturity ? If yes, how much ? Ans. The Maturity Sum Assured along with the Loyalty Addition will be payable to the policyholder if he/she survives till the end of the policy term. 3. Is the lapsed policy can be revived ? 4. What are modes of paying the premium for LIC Plan 841 ? Ans. The method of payment available under this LIC New Bima Diamond Plan is Yearly, Half Yearly, Quarterly, and Monthly.